Amazing Popsicles, Summer Survival Info, Salt Slashing & More! Food Should Taste Good? Well, DUH! New Flavors! 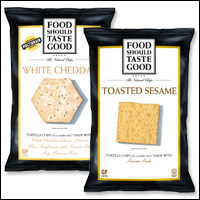 Food Should Taste Good Tortilla Chips - We can always count on FSTG to crank out super-delicious, better-for-you snacks. The two latest varieties are Toasted Sesame (really good) and White Cheddar (really, REALLY good). Each 1-oz. serving (9 - 11 chips) has 140 - 150 calories, 7 - 8g fat, 100 - 135mg sodium, 17g carbs, 3g fiber, 0 - 1g sugars, and 2 - 3g protein (PointsPlus® value 4*). They're a bit higher in fat than our usual snack picks, but the wholesome ingredients and utter deliciousness help to make up for it. Click here to track 'em down, or buy online! Jolly Rancher Awesome Twosome Popsicles and AirHeads Popsicles - These fruity pops taste like classic candies! Ordinary Jolly Rancher Popsicles have been around for a while, but these dual-flavor bars -- in Blue Raspberry Cherry and Grape Green Apple -- are brand-new. The AirHeads pops even boast a "chew-tastic texture." Intriguing! Each bar/pop has 45 - 50 calories, 0g fat, 0 - 5mg sodium, 11 - 12g carbs, 0g fiber, 4 - 8g sugars, and 0g protein (PointsPlus® value 1*). SWEET! Look at all the summery, guilt-free salads popping up on menus everywhere! Quiznos Fresh Farmers Market Salads - These salads make us happy, and not just because they're WAY lower in calories than those crazy Flatbread Chopped Salads that Quiznos used to offer. They look super-tasty -- Caprese Chicken, Harvest Chicken, Mediterranean Chicken, and more. Without dressing, the full-sized salads top out at 260 calories. Pssst... Go for the Fat-Free Balsamic Vinaigrette! 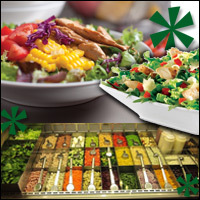 Au Bon Pain Create-Your-Own-Salad Stations - You down with ABP? The chain is revamping its restaurants, adding healthy beverage options (like green tea and coconut water) in addition to the new salad stations. This sounds GREAT... but what's the difference between a create-your-own-salad station and a good old-fashioned salad bar? Noodles & Company Summertime Salads - Despite being named after carby food, this chain isn't off-limits. The latest menu items -- Backyard Barbecue Chicken Salad and Very Berry Spinach Salad -- sound delicious, and a few tweaks will save you a TON of fat and calories. Order 'em without dressing/vinaigrette, and skip the croutons on the berry salad -- then each full-sized salad will have less than 400 calories. Thanks to the saucy BBQ chicken and the spinach salad's figgy glaze, we doubt you'll miss the dressing! And don't forget about the back-by-demand Asian Salad at McDonald's and that new Berry Almond Chicken Salad at Wendy's! 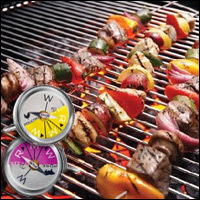 Summer Cookout Food Safety: View Before You Chew! Summer starts TOMORROW, people! Before you fire up the grill, get familiar with this need-to-know info. The USDA recently updated its recommendations for safely cooking whole cuts of meat like beef and pork -- they should be cooked until the center reaches 145 degrees, followed by a rest time of 3 minutes before cutting. For poultry, cook to 165 degrees at the thickest part. So have a meat thermometer handy. (Check out this cute, color-coded set we found!) By the way, we recommend lean cuts like tenderloin and sirloin for beef and pork; in terms of chicken and turkey, go for skinless breast meat. When it comes to marinating meat or poultry, always marinate in the fridge (not outside by the grill), and bring leftover sauces to a boil before consuming them. Our marinades of choice? BBQ sauce with 45 calories or less per 2-tbsp. serving (click for our picks!) and fat-free plain yogurt (as used in this recipe for Chicken D'lish Kebabs!). For more tips on guilt-free summer survival from HG, click here! Congratulations, Weight Watchers! U.S. News & World Report recently ranked the best diets, and our buddies at WW landed the number one spot in the Best Weight-Loss Diets category. Nicely done! ***We're all about foods with hidden talents, and making a person live longer is DEFINITELY a good trick! In a five-year study of more than 135,000 adults, researchers found that those who ate lots of veggies in the mustard family -- like broccoli, cauliflower, and cabbage -- were less likely to, um, die during the study period. Although, people who regularly gnaw on broccoli stems and cabbage leaves probably have healthier habits in general. Just sayin'! ***If you haven't heard, Kashi recently recalled thousands of cases of select varieties of its frozen pizzas, due to possible plastic fragments in the crust. Eeeks. Click for details and check your freezer. ***Want to consume less salt? New research suggests that savory scents could help. Scientists found that extra aroma helped to mask the taste of salt substitutes, a flavor many people find off-putting. Neat! ***Chocolate without any sugar or artificial sweetener? Yup! The latest from chocolate manufacturer Barry Callebaut is dark chocolate sweetened with stevia and other sugarless natural sweeteners. Look out, world -- stevia is taking over! And that's all we've got. HG out! News is for everyone, so pass it around -- click "Send to a Friend" right now!